Plastic foam carves like butter and paints like wood. 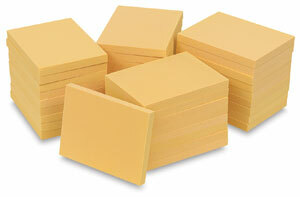 For sculpting, model-making, block stamps & printing. Any tool cuts sharp detail. Won't expand or contract. Also Class Pack blocks. 40 blocks, 4½" × 6" × ½" (11 cm × 15 cm × 1 cm). An ideal size for both relief sculpture and block printing.